In preparation for this year's 7DRL i'm making this video tutorial series on how to make a Roguelike in Pico-8. If you always wanted to try Pico-8 or if you are looking for a simple engine to get into RL development, give it a try! Thanks. I will try to breach out to TIC-80 eventually. Thanks for the feedback, The reason why there is no Threefold Repetition is that the game engine I used is very restrictive. It's a small wonder I got the AI to work as it is. But I'm considering a port to a different engine and I might get the Treefold Repetition going there. But. But worms are actually good for a garden! Yes, but the array wraps to the other side when you drop off sideways. There is padding on both sides, so there is enough to catch the Knight there. Hey Guys. Great Job, I like what you're cooking there. Seems like a really good idea for a final project. You are bringing together a lot of the skills and ideas we talked about over the year. The celebration animation is a particularly awesome detail. - There is no way to change the resolution and no obvious way to change from windowed mode to fullscreeen. In Windowed mode you can't resize the window. I'm running a high resolution on an older machine. Game launched into a a resolution my machine couldn't handle and it required some fumbling to get it running correctly. - It may be me but I feel some input lag. And I'm usually very lenient when it comes to such things. But here, if I flick the analogue stick it almost feels like the fist starts moving by the time I let go of the stick. - Smashing the ground and missing the guys should still have some effect on them. If only cosmetic. A huge stone fist came down just next to them. I expect them to get at least startled. - The Rage ability is fun but seems to solve a problem I never have. When I lose control of the game it's because guys are running away in different directions and I can't follow them all. The Rage ability seems to do a lot of damage in a very limited area. My normal attacks already do that. I wish I head something that kills far away enemies or wipes the screen no matter where they are. - The gameplay is quite repetetive. I would strongly consider adding enemies that require different strategies. See this video to explain what I mean. - I think it would be also fun if you can interact with the environment. Perhaps there is a dam that you can smash which will flood the screen and destroy all enemies. But you can do it only once. Or a rock you can dislodge. Or a hornet's nest. Or a volcano. - Now here's a big one - the game looks drab and almost depressing. It doesn't look like the fun, cartoony game it wants to be. Just because your game is about rocks doesn't mean that you have to restrict your palette to neutral greys. Add color tints to the rocks. Add colorful lighting, shadows and post-processing. Look for some references. Pick a look and try to replicate it. I would strongly suggest experimenting with the colors and lighting now. It will be difficult to change that later. - Here is the second big one - the enemies are a bit boring. They are just rando dudes. If the game is about smashing things it would be cool if the things you smash were extra fun to smash. The fruits in Fruit Ninja are fun to slice because fruit makes a juicy (in both ways) mess when you slice it. You need an enemy design that plays into the idea of smashing things. So maybe the enemies are especially round and blobby so they burst into huge slime explosions when you smash them. Or they are some kind of bird creature that explodes into a cloud of feathers. Or they cary a lot of equipment that shatters on the ground if you smash them. Or they burst into flames. Or they are made of glass. You name it. This would be also a good opportunity to re-think how the game presents your enemies. It's weird that the enemies are these neutral looking dudes. It feels awkward to just blindly slaughter them one by one with your bare hands. It's a bit unclear if this is supposed to be funny or shocking or poignant. I think you are going for a funny game in a it's-fun-to-be-evil-kinda way - because the celebration animations fit that idea. But I think the game needs to lean a lot more into that. Again, there is a lot different directions you can push this into. You can make the enemies mischievious and greedy. Maybe they move on the ground like Gollum or laugh mischieviously like Gremlins when they manage to claim the power so you feel good about killing them. Or maybe they are proud, pretentious shining knights in golden armor that get rekt by your awesome powers of evil. Maybe they're over-the-top diabetes-inducing sweet, cute little creatures so it's extra ridiculous and evil that your goal is to kill them all. Try to push the idea to the extreme. Sketch a few different design and show them to classmates. Ask them what is instantly more appealing. This is all I have. I love this. Keep up the great work! I'm blown away by how cute this is. The head-shaking animation in particular is fantastic. Well done. Glad you like it. Out of curiosity, what is your favorite pastry lineup? 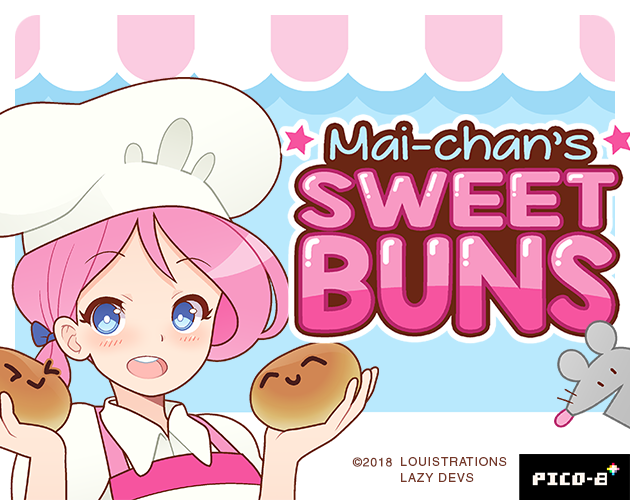 Mai-Chan's Sweet Buns are fresh out of the oven. Grab them while they're hot and juicy! Update: Managed to squeeze in some start screen animations. Oh no! We've picked the same cart! I should have paid more attention to the forum. Loos super interesting! How do you know which ingrediends are required to make a bread? Also, how do you combine them? 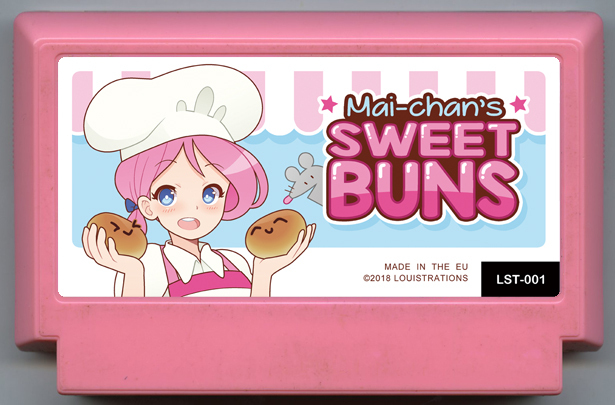 I picked Mai-Chan's Sweet Buns for this Jam. I'm working inPico-8 which I think fits nicely to the NES cartridges of the Famicase. The game itself is a mix between a match-3 type puzzle game and solitaire. It has with some unique mechanics. Players draw cards from a deck. The cards represent orders. Players need to fulfill the orders by finding correct sequences of pastries on the board - either verically or horizontally. Once an order is fulfilled the card is discarded an a new card is drawn from the deck. The game is over when all orders from the deck have been fulfilled. At the end of each level players gain coins. 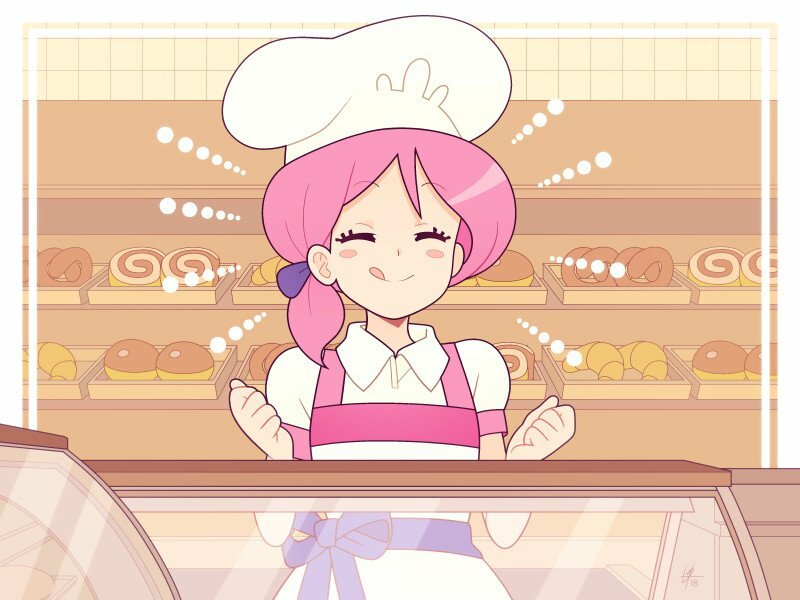 The coins can be spent to purchase recipies for other pastries. There will be 16 pastries in the game. Each pastry comes with its own special ability card which can be used to get out of tricky situations. I've contacted Louis, the arist behind the cartridge and he seems to be pretty hyped about the project. The progress was really great so far. Currenty creating the final art on some of the card abilities and making the menu more pretty. The game should be out by beginning next week! That's weird. How are you playing the game? Did you bring it up in the Browser or by some other means? Can you post a screenshot? Edit: Nevermind, I think I figured it out. Game was interacting weirdly with the Itch.io App. Uploaded a new Version that should fix this. Be sure to click on Update in the App. Game Released! Let me know if you find any issues. Note that I re-named it to "Pico Checkmate". Seriously. I like this a lot and I hope you continue working on in. The level of polish is incredible. I had quite a few moments where the pieces didn't do what I expected. For example, the way the enemies move is unclear. The game states that pawns move like chess pawns but that's not true. They seem to move like a King. I wish the UI would actually show you how enemies can move if you hover over them. Likewise I'm not a big fan of the health points. It means there are two different types of captures - one where your piece doesn't actually move but just reduce the opponent's health at a distance and the second that is like the chess capture if the health is low enough. The interface doesn't communicate the difference well. But also the first kind seems a lot less exciting and more grindy - the board state doesn't change and you can't protect against it like you would against a chess capture. So you basically grind down the health points until everybody gets down to 1. At which points you can start actually playing chess. But maybe the mechanics play out differently in more complex board states? I wish there was a downloadable version. WebGL is laggy on my PC. I'm totally following this game. I looking forward how you're going to develop this further. Great Job! I've implemented the 50-Move Rule. I did not implement the threefold repetition. I did implement a hash system that would allow me to pull it off. But with just a few hundred tokens left, I think the game would benefit more from additional GUI features rather than that rare edge case. Which is a LOT more than I thought I would manage. Will spend tomorrow trying to save every token I can and investing them in UI / Quality of Life features. I still hope can get enough tokens to implement Chess960 or Really Bad Chess Variants. This would require some work on the castling algorithm. I could not stop myself from doing a nice board setup animation. The chess mechanics are implemented. Except from the two type of draws. They are very rare so I consider them low priority at this point. Instead I'm now cleaning up the code and improving the rudimentary AI I had in place. I generally prefer spending the tokens on features that make the game feel more friendly and responsive because the AI probably will never win any tournaments. So for example, while the AI is calculating the best move, it will move the cursor to the most promising piece it currently considers. It makes the waiting time seem shorter but also provides some insight into the AIs "thinking" process. To check for Check you need to implement a function that checks if a given spot is currently being attacked by the opponent. Basically you loop through all of the opponents pieces, iterate trough all of their possible moves and see if they can attack that spot. Then you execute that function on the spot where the King is to see if the King is in Check. Checkmate is more difficult. You need to iterate trough all of YOUR possible moves and see if after you perform the move the king is still in Check. As soon as you find one move that works, you can stop checking. Another challenge is disallowing discovered Checks. So the player can't move into Checking themselves. Basically, if the player wants to move a piece somewhere, try the move real quick and see if the result would make the king be in Check. If yes, undo the move and cancel it. Pico-8 doesn't seem to have a full-fledged classic Chess. There are various Chess projects around but they seem to be "virtual chessboards". So they are typically 2-player chess free-for-all where you can move the pieces however you want. So I thought I make a proper Chess implementation for casual chess players. How hard can it be? This is an old project that I revived for the Chess Jam. Full implementation of Chess rules. Not just a "virtual chessboard"
Nice-to-have features that I will implement if I have tokens left. Game already recognizes Checks, Mates and Stalemates. Castling and En Passant works!